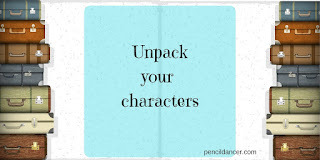 Have you spent hours, days, even weeks filling out questionnaires about your characters? Most writers have done this when we first begin our careers. At some point, you have to stop. Pages and pages of data about your character from the time they started kindergarten, what their favorite color is, and who their favorite Disney princess is won’t move your story forward. If you already have the list, keep it, there are some gems there if you ask why. Let’s unpack the mermaid example. Why did she pick the mermaid’s name over the princess with enough hair to braid for a prince to climb? Perhaps your heroine has a desire to be a scuba diver. Why hasn’t she tried? She’s terrified of water because she once fell off a boat and almost drowned. Why the desire to be a mermaid? If she’d had been a mermaid, she wouldn’t have to be afraid to go back out into deep water. Now, make this count. Your mermaid is up for a promotion at work, the new position will allow her to travel something she’s been dreaming about forever, but what’s this? She has to go with the client on a deep-sea fishing cruise. If she says no, it’s not going to look good, and Pushy Pricilla who’s been one step behind your mermaid since the day she started working at the company will be eager to take the job. Now your readers have a reason to care, to cheer your mermaid onto that boat, and they'll stick with her as she falls off the boat--you know she has to get in the water right? What if you don’t have a list? Start with the why of your character. You probably have a name, a story idea and possibly a career picked out. From there start asking why this idea and job connect or don’t connect. What’s reason for him/her to continue getting up and going to work every day? Why is it important to your character to wear a certain item (is it an heirloom? Or a watch with a timer to remind her to take a life-saving medication? Maybe she’s decided to stream line her life so everything in her closet and jewelry box has to coordinate—wait—if that’s the reason then ask why is that important to her and what happens if she can’t do that one morning? Look at your best friends. Sure you could fill in a character questionnaire about them, but on paper would you recognize them? No. They’d be flat, could be one of the hundreds of people that like the color blue, have blonde hair, and watch black and white movies. Look closer though, and ask why? Why do your best friends pick a certain restaurant? Why does he only drive Chevy trucks? Why won’t she eat shrimp? Your friends are complicated; they carry around virtual suitcases filled with the answers to the question why and so do your characters—all of them, even the waitress at the diner who jumps every time a fork hits the floor. Unpack your characters, and your stories will have readers flipping pages to find out what happens.